he gave 50 lacs from his pocket! is that really his own hard earned money or just the result of his "cut" from some business deal which he wasn't even a part of? if zardari wants to give something which will really help the people of pakistan,.. he should give his own life! These are the men of honour! he is a liar ! booking for 7500 plots where actually only 1500 existed, and making billions out of the booking charges then developing the 1500 plots and buying back the files to be burned to ashes. Well thats excellent news and Allah can lead anyone to right path. However I pray and wish that he is doing sincerely as he does not enjoy a very sound reputation and is believed to be the most crooked of all developers. Here is thread to refresh the memories of all the pakwheelers. But I reiterate myself by saying again.Allah can lead anyone to right path. If it is true then its awesome but this all is people's money which he earn throw back door and in Musharaf Govt. !!! I am surprised by peoples negative reaction. I usually just surf through pak wheels, but i just find it frustrating that, no wonder what people try to do for our country, some peeps keep up the negative parts of it. 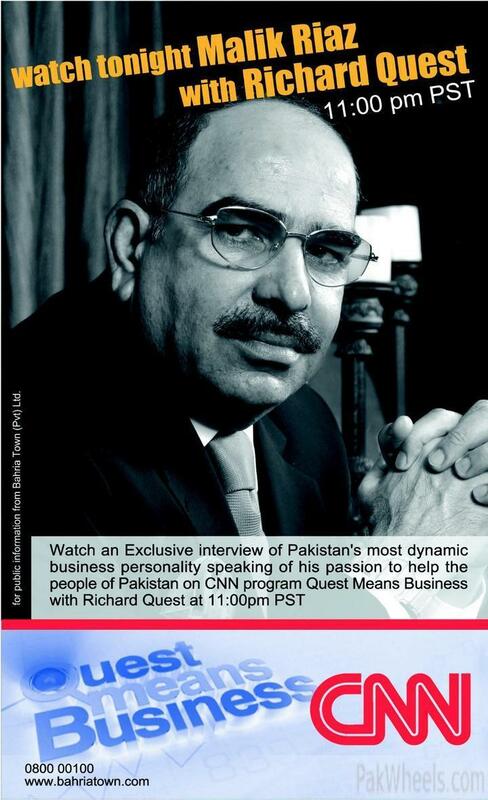 Its none of your business on how Malik Riaz got "rich". Try looking at the bright side of the story. Malik Riaz has given over 10 carror RS as soon as the flood happend. Instead of bitching about other people, do something good for your country and try making a difference. You can never satisfy our kaum.